For the 2nd week in a row, the big boys needed a few extra holes to decide the Championship – This week it was The Zurich Classic of New Orleans. And just like last week both players (Bubba Watson and Webb Simpson) made birdie on the first playoff hole in dramatic fashion. 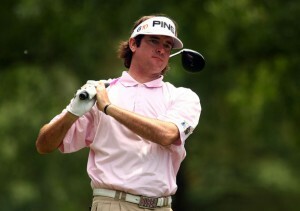 On the 2nd playoff hole Bubba found himself in a fairway bunker with a dangerous shot over water to the green. “What do I got?” Bubba asked. “210 yards,” his caddy replied. You’re kidding me right?! I had just made the point last week in my op-ed piece that the field has caught up to Tiger Woods because strength conditioning and equipment have nullified his Tiger-esque shots (like the one he pulled off in ’02 at Hazeltine when he hooked a 3 iron 200 yards out of a fairway bunker into the wind). After Bubba pured his 7 iron and watched it launch towards the green you could hear him say “Be right, little darlin’!” It wasn’t quite right, but good enough. He still had to negotiate a fifty-foot 2-putt to lock up the victory after Webb failed to get up and down from the greenside bunker. Thanks Bubba, I appreciate the help, although I don’t think the field has caught up to you. According to ShotLink, he’s the only one to ever hit the green in two from this bunker – and he’s done it three times in his career! This is Bubba’s third win. He won the Travelers last year and the Farmer’s earlier this year besting the other lefty, Phil Mickelson. He also darn near won The PGA last year, losing in a playoff to Martin Kaymer. Poor Webb was a victim of a stupid rule that may be changed soon. Playing the 15th on Sunday, he addressed a tap-in from 5 inches when the wind moved his ball. This cost him a one-shot penalty and ultimately the tournament. Webb has yet to win on the PGA Tour. Doh! On a side note, across the pond in South Korea, at the Ballantine’s Championship, Lee Westwood cemented his number one ranking with another win. He made a late run, shooting 67 on Sunday and winning for the 2nd time in as many weeks. Meanwhile Tiger lounged on a hammock in his backyard and played Bing-Bag toss with his neighbor Buck. Maria Hjorth brought home the bacon this week and fried it up in a pan. The 37 year-old mom won for the fifth time on the LPGA tour at the Avent LPGA Classic in Mobile, AL. She started the day 3 shots behind the leaders, #13 in the world, Song-Hee Kim and a youngster, 16 year old Lexi Thompson who was invited by the sponsor. Michele Wie missed the cut, and Paula Creamer finished tied for 60th. Maria is mother of a 2 year-old daughter, Emily and guess what??? Daddy was there too! He’s Shaun McBride, the PGA Tour caddy of Bryce Molder and he took the week off to caddy for his beautiful bride. After the tournament the two promptly hopped in their station wagon, stopped off at Dominos, and tipped the baby sitter $5,000. Finally, the first Major of the year for The Champions Tour is at Shoal Creek in Sunriver Oregon. Defending Champ Fred Funk will be there, plus 1990 PGA Champ, Wayne Grady and Lanny Wadkins. The ladies are off this week. Until next week - hit it, go find it, and then hit it again.